JAMMU, MARCH 10: Governor Satya Pal Malik today inaugurated Dr. Karan Singh Library for Senior Citizens at Gulab Bhawan, Jammu. Dr. Karan Singh, former Member of Parliament, Rajya Sabha, Shri K Vijay Kumar, Advisor to Governor, Shri Chander Mohan Gupta, Mayor JMC besides prominent citizens from all walks of life were present on the occasion. The newly inaugurated library hosts a collection of books in Hindi language. Governor, in his address, observed that books hold great value in enhancing our understanding and empower readers by disseminating knowledge. He emphasised the importance of inculcating reading habits among the people particularly the youth in the age of digital gadgets. Public library serves a purpose by providing a common place of knowledge sharing to readers in this fast paced life, he added. Governor underlined the importance of recognising the vital contribution of writers in preserving our history, culture and linguistic wealth. He complimented Dr Karan Singh for his active involvement in carrying out varied activities for welfare of the public. While praising Dr Karan Singh for this initiative, Governor observed that personalities like him have always given importance to book reading and complimented him for his endeavours towards promoting sharing of knowledge. 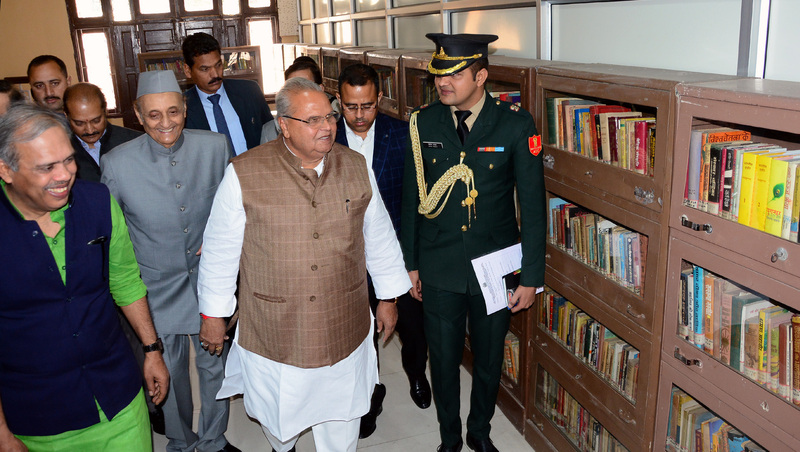 Governor also inspected the library and praised the facilities provided for readers. Speaking on the occasion, Dr. Karan Singh said that the library dedicated to the Hindi Language is a gift for the people of the State. Not only senior citizens, but the youth are also welcomed to gain the wealth of knowledge contained in the books here, he added. During his welcome address, Shri Vikram Aditya Singh underlined the importance of preserving cultural heritage through books. Shri Ajatshatru Singh, Member J&K Legislative Council, presented the vote of thanks.